It was not immediately clear what evidence or report Trump was referencing. On Friday night, Breitbart News reported on radio host Mark Levin’s claim that Obama executed a “silent coup” of Trump via “police state” tactics. 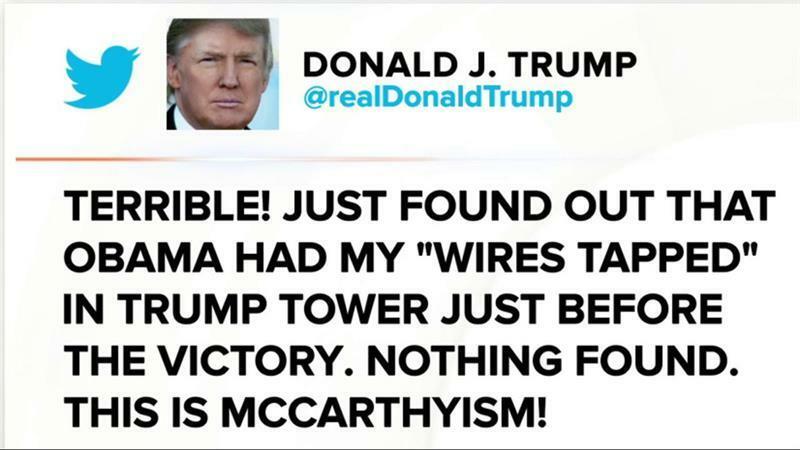 Since Trump has a tendency to tweet about things he has just seen on TV or read in the press, and since there has been no definitive report on that topic, Trump may be referencing an internal report. And since the allegations in his tweets are material, and will surely provoke a response by Barack Obama (at least his twitter account), this may escalate significantly. Also on Saturday, prior to the wiretapping tweet, Trump had also linked Obama to Attorney General Jeff Sessions’s meetings last year with Russia’s U.S. ambassador. “The first meeting Jeff Sessions had with the Russian Amb was set up by the Obama Administration under education program for 100 Ambs,” he tweeted. Trump on Saturday also blasted Obama for meeting with Kislyak 22 times while president, as the Daily Caller reported first on Friday, tweeting: “Just out: The same Russian Ambassador that met Jeff Sessions visited the Obama White House. The Trump administration has sought to push back on accusations of being cozy with Moscow, by pointing out instances of Democrats meeting with Kislyak. Critics have responded that the issue isn’t that Sessions met with the ambassador, but that he falsely told Congress he hadn’t while under oath. So far, according to some media outlets, Trump has failed to “fend off” the Russia questions, which continue to reemerge virtually every night in some new front page story on the WaPo, NYT, in a recurring pattern as described in the following blog post. To be sure, Trump didn’t dwell much on the alleged wiretapping and by 8:19 a.m., the president had turned his sights to Arnold Schwarzenegger who succeeded Trump as host of “The Apprentice,” and who has sparred with Mr. Trump over the president’s policies on immigration. “Arnold Schwarzenegger isn’t voluntarily leaving the Apprentice, he was fired by his bad (pathetic) ratings, not by me. Sad end to great show” Trump tweeted. “Sad end to great show,” he concluded.